The Biscuit category is a massive one for local retailers and keeping on top of the latest trends is key to maximising profits. SLR speaks to some of the key players to find out where retailers should be focusing their attentions in coming months. It will surprise no one to hear the biscuit category is big. In fact, it’s bigger than that. It’s huge. According to Nielsen figures to October last year it’s worth around £2.3bn in the UK, and provides a great opportunity for c-stores to drive sales. But it’s not about stacking them high and selling them cheap. The key to a profitable fixture is tapping into the latest trends, consumer needs and shopper missions. The biscuit market essentially comprises three main sectors: sweet, healthy and savoury. Unsurprisingly, sweet holds the lion’s share of the biscuit market, worth £1.4bn [Nielsen, Aug 2016] while the savoury biscuit category (excluding crisp breads and crackers) has seen over 20% value growth over the last two years according to the same data. Despite being a relatively recent development, healthy biscuits continue to hold their own in the market, with a value of £485m [Nielsen, Oct 2016]. A relative newcomer on this side of the Atlantic, the US megabrand Oreo is now valued at £50m [Nielsen, Aug 2016] in the UK, growing at 14%. “It’s important to note that it is one of the biggest contributors to growth for the sweet biscuits category in the UK, contributing an impressive £11.2m to the category in 2016 alone [Nielsen, Aug 2016]” says Susan Nash, Trade Communications Manager at Mondelēz International. “In July 2016, the brand extended its flavours range with Oreo Strawberry Cheesecake and Oreo Mint and both have been successful recruiting new consumers to the category and are now worth almost ££4.7m [Nielsen, Jun 2017] combined. 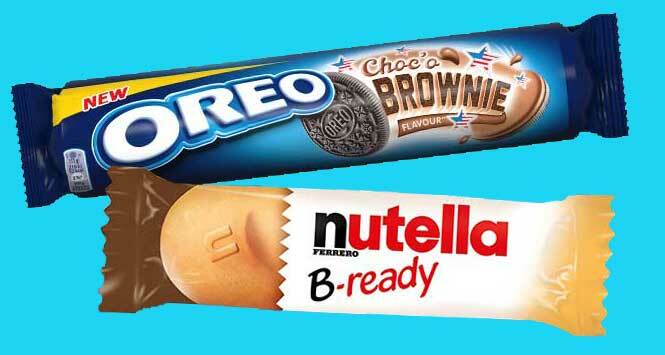 Oreo is the world’s number one biscuit brand and in October last year, it launched a public consultation asking the UK to help it decide on its next addition to the range with 43% voting for a biscuit featuring a chocolatey, brownie batter centre in the Oreo cookie. 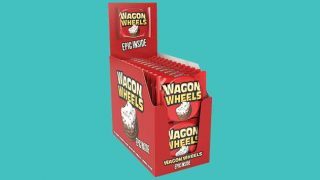 The launch will be supported by a £2.5m spend through AV, experiential, sampling and PR and aims to drive incremental sales to the sweet biscuit category and continue to recruit the next generation of biscuit lovers. While Oreo may be the new kid on the block, Mondelez’s Cadbury brand is the old master, although it only took its first step into the biscuit arena under Mondelez’s control in April with the launch of Cadbury Roundie. The product blends layers of crispy wafers with thick chocolate cream and is coated in delicious chocolate. The biscuits are available in a multipack of five including milk chocolate, dark chocolate and caramel wafer variants, with the milk chocolate variant also available in a single format. More recently, the company unveiled its second Cadbury biscuit launch – Cadbury Crunchy Melts – which feature crunchy chocolate chip cookies with a soft melting centre. For those seeking a little more luxury, the cookies can be heated up in the microwave by following the instructions on pack. The new cookies come in 156g multipacks in three variants – Chocolate Centre, Double Indulgence and Soft Cookie Centre. belVita Breakfast has lead the segment by expanding into new formats that satisfy consumer need states. It is now worth £80m [Nielsen, Jun 2017], currently showing +6% growth. Launched in August 2015, Soft Bakes has been belVita Breakfast’s biggest innovation to date, already worth £18.2m [Nielsen, May 2017]. belVita’s Soft Bakes range is expanding further with the launch of an indulgent NPD – Soft Bakes Filled. The product is a soft and chewy baked biscuit made from five wholegrains, including crushed buckwheat and oat flakes, with two fillings to choose from – Choco Hazelnut and Strawberry. The range expansion will be supported by a £2m marketing campaign, including sampling, TV ads and in-store activation. In retrospect, it looks like a no-brainer but Nutella has recently entered the biscuit category with its Nutella B-ready line. Backed by a £2.8m multi-touchpoint marketing investment, the launch is aimed at the many consumers who already love the Nutella brand. The media campaign spans multiple channels including a brand new 30-second TV advert, which hit the nation’s screens recently and will run to mid-October. Levi Boorer, Customer Development Director at Ferrero UK, comments: “Nutella B-ready is a complementary addition to the Ferrero range, offering shoppers more ‘sweet snacking’ solutions throughout the day. We see B-ready as the ideal mid-morning snack, containing fewer than 120 calories, while other products – like Kinder Bueno – are much more suited to post lunch snacking. Nutella B-ready is available with an RSP of 59p (single bar) or £1.99 (six-pack). Burton’s Biscuit Company is announcing significant investment in its £50m [Nielsen, Oct 2016] Maryland brand over the next 12 months, with a range wide packaging refresh, innovation and a social media campaign. The new contemporary look and feel for Maryland will improve standout and range navigation for shoppers, believes the company, and will come to market with the launch of Maryland Thins; a new addition to the range launching this month. Targeting younger shoppers aged 25 – 45 years old looking for lighter snacking options, Maryland Thins will be available in two flavours, Milk & Dark Choc Chip, and Salted Caramel (RSP £1.49/128g), available in shelf-ready packaging in case sizes of nine. The new pack design is being rolled out to the rest of the range, supported by digital and social media activity, and TV advertising to be aired in Q1 2018. “Maryland remains the nation’s no.1 cookie brand, growing at 10% year-on-year [Nielsen, Feb 2017], and gaining an additional 800,000 households in the past year alone [Kantar, Feb 2017] thanks to continued growth of Maryland core and innovative NPD,” says Mandy Bobrowski, UK & Ireland Marketing Director at Burton’s Biscuit Company. 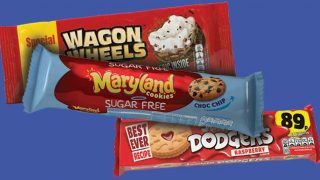 “The new designs will ensure Maryland remains relevant and contemporary, improving standout on-shelf and in turn, enabling shoppers to better navigate the fixture, whilst reinforcing the message of Maryland as cookie experts and a beacon brand on-shelf. International biscuit giant pladis recently launched a new TV ad for its Jacob’s brand supporting its sharing backed snacks range, Jacob’s Cracker Crisps. The ad ran during ITV’s Coronation Street and has been received positively, says the company. With the continuing rise in interest in free-from foods, gluten-free treat brand Mrs Crimble’s has revealed a new character-led brand identity for its entire product range beginning with its best-selling Choc Macaroons – set to bring the brand to life in the free-from fixture. The company unveiled a new brand identity earlier this year that was rolled out across its entire product range, beginning with Choc Macaroons. The new look and feel brings the long-established Mrs Crimble’s brand to life in the form of a wooden spoon character, evocative of the brand’s baked treats that are made, not manufactured. The beacon brand in the gluten-free market was created over 30 years ago and is now one of the UK’s biggest cake brands. It has been calculated that one of its best-selling Choc Macaroons is eaten every second worldwide. Mrs Crimble’s has garnered a sizeable free-from following, and is looking to grow this community with a consumer-centric brand strategy that focuses on championing glamourous, accessible food and irreverent humour. One in 100 people are currently diagnosed with coeliac disease, according to Coeliac UK, while 13% of the UK’s population currently avoids, or is cutting down on, gluten – the highest proportion in Europe. A further 8% would like to cut out gluten from their diets.